Back in the day, which wasn’t all that long ago, meters performed only the most basic function: They reported your blood glucose level. That was it. It was up to you to write each number down in a logbook so that your medical team could review the data and help you figure out what was going on in your body, after the fact. Logbooks were originally the size of checkbooks and usually had badly organized squares for entering your numbers. Logging took time, as did studying the log. Recognizing patterns within this jumble of numbers was a bit of an art form – one that some health-care providers never mastered and others didn’t have time for. Patients who diligently logged every blood glucose reading were often disappointed when their doctors failed to pay these logs a similar degree of attention. Then technology came to the rescue – or so it seemed, at first – with meters that could remember past readings and even create logs when connected to a computer. Most meters nowadays have a memory and can be plugged into a computer, where the data can be stored and displayed in a stunning array of colorful graphs, charts, and reports. Software, it seemed, had the capacity to revolutionize diabetes management. It made recording blood glucose readings easier for patients and, in theory, analyzing them faster for health-care professionals, since trends could easily be spotted and addressed. The analytical features of newer meters, however, have had an unintended consequence: Both doctors and patients often rely too much on the brains of the meter, rather than on their own brains. By letting their meter do the brainwork, many people have stopped thinking critically about their numbers, or have even stopped thinking about them altogether. Instead, in many people, a bizarre form of zombie-like autopilot has taken over. This means that people check their blood glucose and then go on about their business without thinking about the reading they just took. You should really stop to think about the number on your meter, if only for a minute. But many people get so used to checking their blood glucose and leaving the analysis for later that even a crazy number doesn’t get their attention. Any number that’s an outlier – much higher or much lower than normal – should not only get your attention, but also demands that you immediately take another reading. You should always recheck an outlier. Maybe your glucose really is crazy high, and if so, you need to think about what caused this. Or maybe you just ate a banana and didn’t wash your hands before you took a blood sample (banana residue on the skin is notorious for causing false highs). Of course, the death of the paper log was fueled not just by the rise of “smart” meters, but also by the rise of various e-logging methods. There are a mind-boggling number of “apps” for both tablets and traditional computers that can be used to log blood glucose readings, and a growing number of meters can send data to other devices automatically. The goal of these technologies is convenience, of course, but too much convenience can take your brain out of the loop. And, like paper logging, e-logging apps take time, so few people stick with them for very long. A related problem of automation is the loss of critical thinking that can occur when you’re looking at the regurgitated data, either on your meter or using an app on a computer or tablet. While visual representations of data can be powerful and useful, be sure to always pay attention to the data used to build the graph. How many readings are being shown? A classic mistake, for example, is to adjust your insulin or drug regimen based on an app or meter telling you that 100% of your blood glucose readings at a given time of day were above target, when in fact you took only one reading at this time of day over a period of months. One outlier, of course, should never make you (or your health-care provider) rethink your treatment decisions. In short, whether you’re looking at your meter’s screen or at a computer screen, take a moment to think about the context of the information that’s in front of you. Several meters in the most recent generation sport a “tagging” feature. This means there is either a button or a menu item that lets you tell the meter whether the reading it just took was a fasting (before eating) or postprandial (after eating) value. In some meters, this is a feature that can be turned on or off, while in other meters, the device forces you to tell it something. The goal of tagging is to help organize the data that your meter stores. It allows the meter’s software to report separately on fasting and postprandial values, and ensures that you don’t have to guess later on whether a reading took place before or after a meal. This distinction is important, because your before-meal and after-meal blood glucose targets are different. A meter that can help you recognize, for example, that your random numbers are good – but that your fasting numbers are above target – is a handy tool indeed. Of less help is a more widespread feature of today’s meters, which is giving the average of all readings within a given time period (commonly 7 days, 14 days, or 30 days). Averages don’t tell you how consistent your blood glucose levels are, or whether there’s any pattern that might be problematic. So should you still manually log to avoid “zombie brain,” even if your meter stores readings automatically? Yes, I think so, but not all the time. Logging all the time isn’t necessary, but a periodic back-to-basics refresher is a good idea. Think of it as an exercise for your thinking process. Writing numbers down, either on a piece of paper or on a tablet (or other device), makes you think about what they mean in a way that just looking at them doesn’t. I think that people who log some of the time probably think more about their numbers all of the time. Thinking about your numbers can be done in real time, and it should be. But identifying possible causes and effects also requires some Monday morning quarterbacking. You should make time periodically to sit down with your data, no matter how you’ve chosen to gather it, and study it. Your numbers tell a story – the story of how your therapy is working and how it isn’t. And those stories are empowering because they let you make smart changes. Good data, carefully considered, is the key to effective self-management of diabetes. If you have a meter with a tagging function, looking at what happens around mealtimes is easier because the software will report before- and after-meal averages separately. This sorting lets you easily see what’s happening to your blood glucose level after you eat. But even with a non-tagging meter, glancing at the modal day report can help you spot trends in your blood glucose readings. 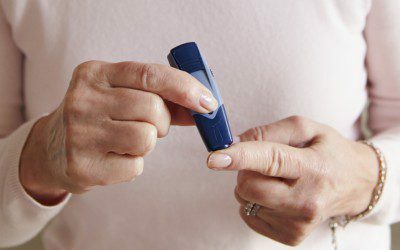 We’ve come a long way since the home blood glucose meter made its debut in 1978. Gasoline isn’t 63Â¢ a gallon, disco is dead, and the 8-track is a distant memory. There are now 7.2 billion people on the planet, and in the United States, the diabetes population has more than quintupled to 29.1 million. Personal blood glucose monitoring changed, for all time, how we view and manage our diabetes – and it has the potential to drive even more changes in the future. Diabetes is unique in that it’s largely a self-managed disease. But effective self-management requires two things: good tools and the knowledge to use them correctly. In today’s world, a smartly deployed meter is the key to successful self-management. The tool has come a long way. But what about you? Are you using your meter like it’s 2014, or are you still using it like it’s 1978? If you practice smart monitoring – using your meter correctly, testing in patterns, logging and thinking about your numbers, listening to the stories your numbers are telling you, and using this information to manage your diabetes better – then you’ll be healthier, happier, and ready for what the next three decades have to offer.